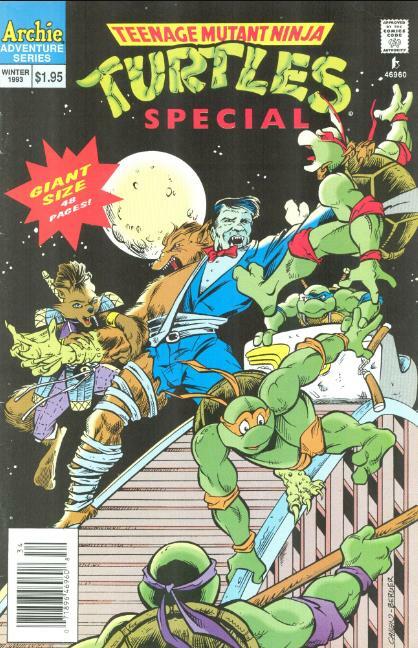 *I would place “The Return of… Monsterex!” between the prologue of TMNT Adventures #41 and TMNT Adventures #42. Mainly because that is the closest narrative gap corresponding to when this issue was published, but also because Ninjara shows an unfamiliarity with American culture and entertainment. In issue #41, Raph was shown taking Ninjara to museums and teaching her about American pastimes, so this seems to fit in around there. *I would place "It Takes Guts..." shortly after April O'Neil: The May East Saga #3. As it references the events of that miniseries, which was retconned into just a nightmare in TMNT Adventures Special #11, then "It Takes Guts..." cannot have "really happened", either. If anything, a beautiful cover. As much as I appreciate Garrett Ho's style and efforts on this issue's main story, that cover did tease me into getting psyched for an epic Chris Allan Monster-Vision Monster Mash!